Be enchanted by the lush beauty of Cambodia and the excitement of bustling Phnom Penh. See the sights by tuk-tuk in Siem Reap and go deep into the jungle as we explore the mysterious 12th-century Angkor Wat. Peer into Vietnam’s imperial past and descend into the Vietcong’s Cu Chi tunnels. Indulge in the delicious heritage, culture and cuisine of these fascinating Indochinese countries. 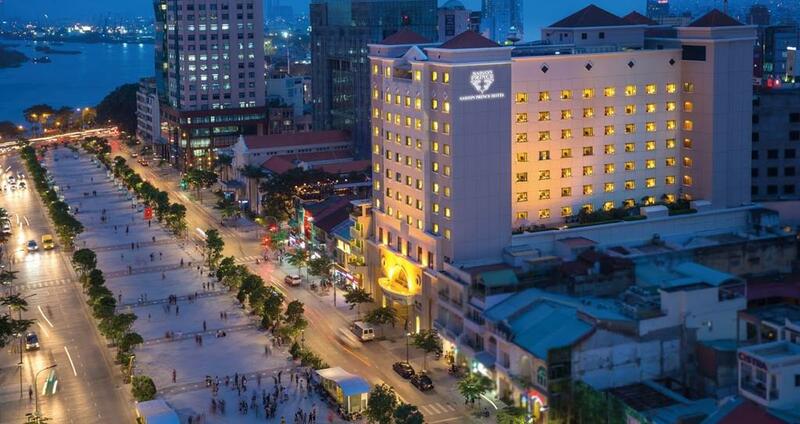 Wander through ancient wonders including the Notre Dame Cathedral, Jade Emperor Pagoda and the former Presidential Palace.This guided tour is the perfect introduction to Ho Chi Minh City. Cost includes guided walking tour. Throw on a conical hat and float through the busy waters of the Mekong Delta on a sampan boat. You'll pass fishing villages and floating markets bustling with locals and tourists alike. Take in the beautiful jungle as you glide through narrow waterways. Cost includes round trip transfer and sampan boat tour. Be enchanted by the lush beauty of Cambodia and the teaming excitement of bustling Phnom Penh. See the sights by tuk-tuk in Siem Reap and go deep into the jungle as we explore the mysterious 12th-century Angkor Wat. Peer into Vietnam’s imperial past and descend into the Vietcong’s Cu Chi tunnels. Indulge in the delicious heritage, culture and cuisine of these fascinating Indochinese countries. Our Indochina trip begins with an overnight flight to Phnom Penh, Cambodia, Kingdom of Wonder. After arrival, transfer to your hotel. Take time to relax and unwind before our welcome orientation this evening. Be enchanted by the unique French colonial architecture, palm-lined boulevards, majestic Khmer ruins and lush landscapes as we discover the indelible spirit of this exotic land. Cambodia’s capital is the perfect place to delve into the country’s history and culture. Our morning city tour includes the ornate Royal Palace, the Silver Pagoda, and the National Museum of Khmer Arts with graceful statues of Hindu gods and ancient Sanskrit tablets. Later, we visit the hilltop Buddhist Temple Wat Phnom, the Choeng Ek Killing Field Memorial, and the Toul Sleng Museum, recounting the rise and fall of the Khmer Rouge in the 1970s. Cambodian food is Southeast Asia’s oldest cuisine offering amazing curries, stir-fried lok lak, and savory noodle dishes. Experience tasty Khmer specialties at our dinner tonight. After breakfast, we drive to Siem Reap. En route stop to visit the fascinating spider market and ancient Naga Bridge. Check into our hotel early this afternoon with free time until our exciting ‘tuk tuk’ trip along the colorful riverside of Siem Reap. Our excursion includes a visit to a lively food market where locals gather to picnic with their families. (Crispy crickets anyone?) Try out your negotiating skills as you shop for bargains before a traditional dinner this evening. Ancient temples rise through thick mysterious jungle as we visit the UNESCO World Heritage Site of Angkor Wat and Banteay Srei temples today. Angkor Wat is famous for its splendor and features the longest continuous bas-relief in the world narrating stories from Hindu mythology. It was originally constructed as a Hindu temple dedicated to the god Vishnu for the Khmer Empire, then gradually transformed into a Buddhist temple towards the end of the 12th century. After lunch at a local restaurant, we visit incredible Ta Prohm, the fortified city of Angkor Thom, the mysterious Bayon Temple, and the Terrace of the Leper Kings. Surrounded by the jungle, ancient temples settle among enormous fig trees and giant creeper roots slowly becoming reclaimed by the powerful forces of nature. Return to Siem Reap this evening. Board our short flight to Ho Chi Minh City, Vietnam. 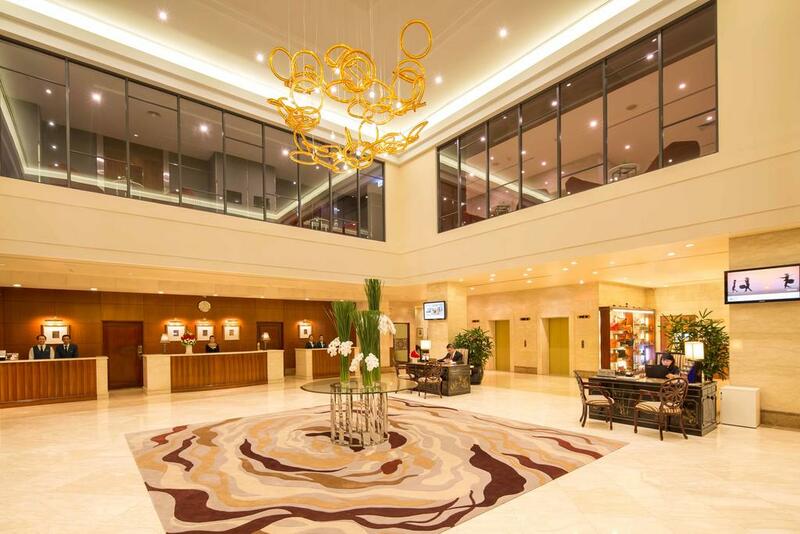 Upon arrival at Tan Son Nhat International Airport, we transfer to our hotel. Time permitting; opt to participate in a half day city tour. Sights include Notre Dame Cathedral, French-style Colonial Post Office, Jade Emperor Pagoda, the former Presidential Palace, and a visit to Ben Thanh market. Otherwise the remainder of the afternoon is at leisure. Join us for tonight’s relaxing Vietnamese buffet dinner and sunset cruise on the Saigon River. We depart early on our excursion to the Cu Chi Tunnels. This is an incredible underground tunnel network of approximately 125 miles, built by Vietcong, housing hideouts, hospitals and shelters. Afterwards, visit to the local market of Cholon and bustling old town “Saigon.” We’ll also see the War Museum, featuring photographs and weapons of the Vietnam wars, as well as the original French “Guillotine.” A free evening in Ho Chi Minh is perfect for night-owl revelers with a seemingly endless array of diversions like stunning rooftop bars, pulsating nightclubs, or fun night markets and street bars. Take your pick in the city that doesn’t sleep. Enjoy today at your leisure shopping for souvenirs or join an optional excursion to the Mekong Delta where we take sampan boats through narrow jungle canals, fishing villages and floating markets. In the evening we are invited to a water puppet show, a unique Vietnamese art form performed in a large pool. At our farewell dinner, savor dishes from this thriving food scene with delicacies including Pho and fresh seafood infused with fragrant herbs. For some of us the exploration ends in Ho Chi Minh City this morning. Bid farewell to friends and before jetting back home with memories to last a lifetime. For those going on the extension: Hanoi and Ha Long Bay await. After breakfast, transfer to the airport for our flight to Hanoi. Hanoi, the capital city of Vietnam, is a stylish and gracious city that retains a unique old world charm and some of Asia’s most striking colonial architecture. The many lakes and parks also create a relaxing atmosphere in this otherwise bustling city. Our afternoon tour starts with a visit to One Pillar Pagoda, the Temple of Literature (the first national university of Vietnam built in 1070), and the “Hanoi Hilton” prison (where John McCain and other POWs were kept during the Vietnam War). Afterwards, hold on tight during a fun “Cyclo” rickshaw ride through the buzzing Old Quarter of Hanoi. During your free evening, soak up the nightlife from a plastic stool in the walking street district sampling steamed peanuts and exotic snacks, or go high-end at a famous jazz club or insane multi-level nightclub. This morning, we travel to Ha Long Bay, a UNESCO World Heritage site and one of the world's most spectacular natural wonders. Cruise along the Bay on a typical Bai Tho ‘junk’, a replica of an ancient Asian sailing vessel, and enjoy the picturesque scenery with some 2,000 limestone islands rising amazingly from the clear, emerald waters. The limestone karst formations are strewn with beaches, grottos and beautiful caves. Along the way we will anchor for a leisurely swim in a secluded cove and take an excursion to one of the many hidden grottos beneath the towering cliffs. Enjoy a leisurely dinner on board tonight with tranquil views of the bay and an unforgettable sunset from the upper deck. After a morning swim and delicious brunch on our boat, we disembark for our transfer back to Hanoi. En route, stop in a local village to shop for handmade ceramics and pottery. Enjoy some free time for last minute sightseeing before our farewell dinner of fresh, local ingredients. After a morning at leisure we transfer to the airport for our flight home with dreams of returning to this land of enchantment soon. * U.S. citizens require visas for Cambodia and Vietnam – see terms and conditions or contact AESU for details. Wander through the labrynth of stalls and try your hand at bargaining at the Russian Market. 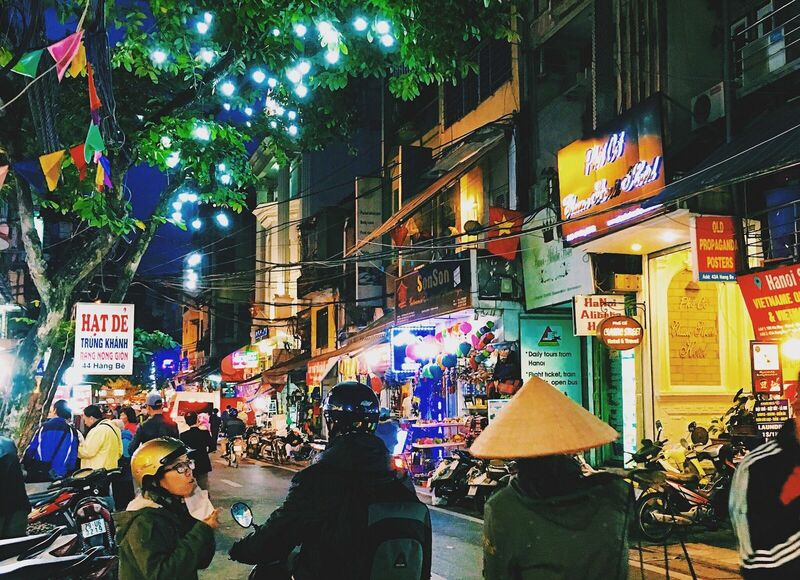 You'll find everything from traditional street food to the perfect souvenir. About an hour outside the city center, NGO Wildlife Alliance has created a safe-space for rescued animals to recover before being released back into the wild. The center's "Day in the life of a Zookeeper" program allows you to get up close and personal with the animals, including feeding elephants. Created by landmine victim Aki Ra, this museum is dedicated to ridding the country of explosives leftover from the war. You'll see mines, mortars and other weapons that have been collected from around the country. Home to an ancient temple, manicured lawns and fascinating, preserved buildings, Wat Damnak is a beautiful place to spend an afternoon. You can wander the gardens, visit the massive library or simply people watch and admire the intricate architecture. In 1887, Cho Vai Canal was filled in, turning two streets into one and creating 'the most beautiful street in Sai Gon' at the time. Today, it serves as a hub for tourists and locals alike, bustling with people and activities. Walk the streets lined with trees, a misting system to keep cool, music and light systems, public toilets and wifi. Take a trip back in time and visit the site of crashing tanks during the Fall of Saigon in 1975. The Independence Palace, also known as the Reunification Palace, housed the executive branch of the southern governement during the Vietnam War, and still has maps hanging on the basement walls, where there was once a bomb bunker. 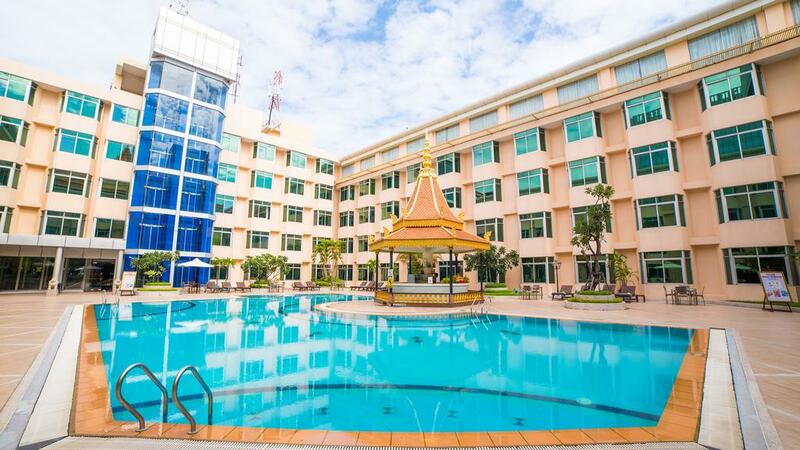 Centrally located in Phnom Penh, the Phnom Penh Hotel features air conditioned rooms with views of the city and pool. Amenities include an outdoor pool, rooms with cable tv, four restaurants and a bar. Prince D'Angkor Hotel and Spa features an outdoor, salt-water pool, spa baths and a fitness center. All rooms include wooden flooring and Khmer-style furnishings, as well as a satellite tv. Located in Siem Reap's Old French Quarter, it is just a 10 minute walk to the Old Market, Pub Street and Angkor Night Market. 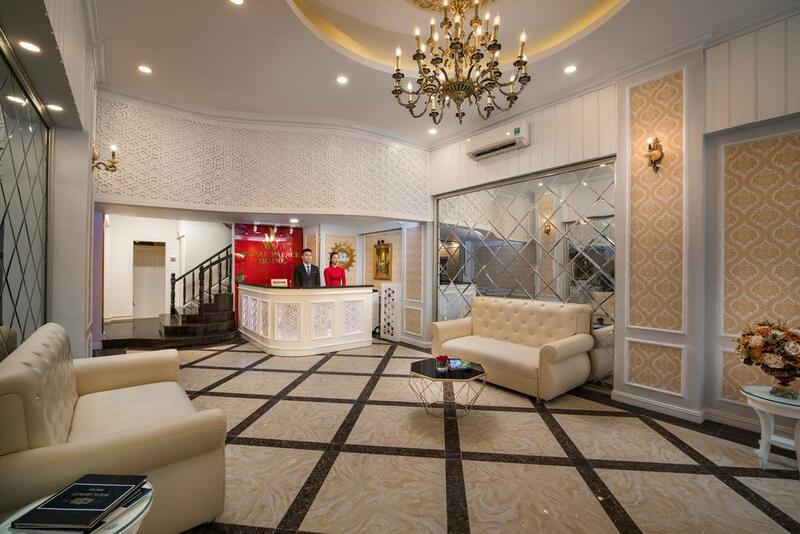 Located on Nguyen Hue Boulevard, Saigon Prince Hotel offers easy access to Ben Thanh Market, Saigon River, Museum of Ho Chi Minh, shopping and nightlife. Amenities include a gym, swimming pool, spa and wifi throughout the property. 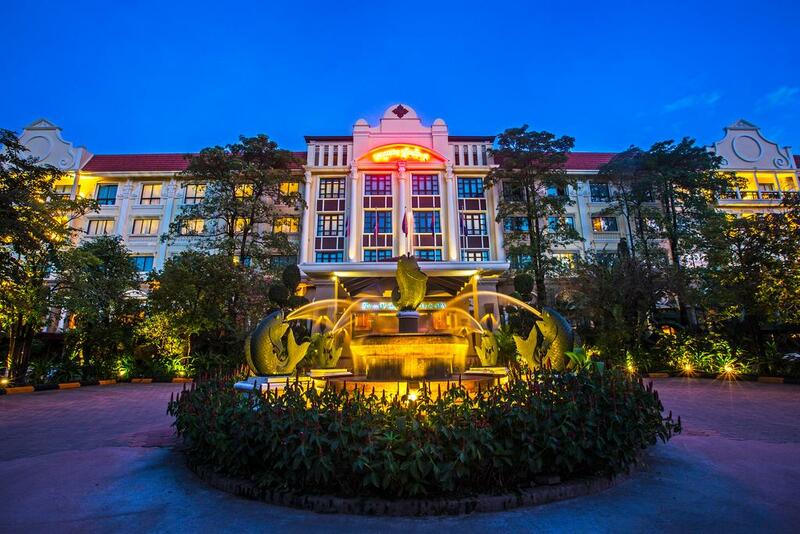 Located right in the heart of Hanoi, the Royal Palace Hotel offers guests air-conditioned rooms with cable tv and wifi. Just a five minute walk will find you at Hoan Kiem Lake, and bicycles are available to rent from the tour desk. 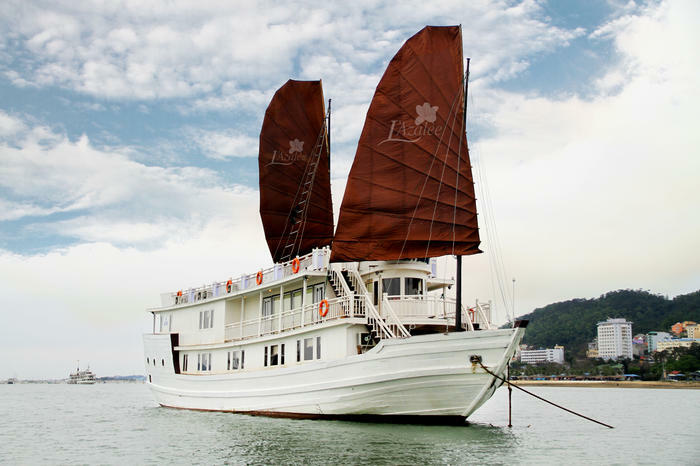 Cruise through Ha Long Bay on a traditional overnight Junk, replica of an ancient Asian sailing vessel. On-board dinner and brunch are included. Wake up with views of towering limestone and turquoise waters. * Price per person based on a twin share room. If you're traveling alone, AESU will attempt to arrange for a 2-share room (same gender). Please see rooming policy. If you prefer a single room, a single supplement of $195 for the 9-day package, or $590 for the 12-day package, will apply. Fly into Phnom Penh, return from Ho Chi Minh City for the 9-day program, or return from Hanoi for the 12-day program. 9 days to a friend!